Somewhere, under the rainbow…good times were had. 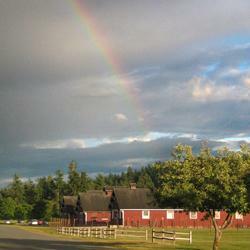 Lakewood Historical Society is up to any challenge. 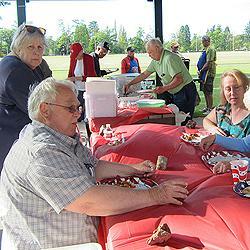 Their picnic in the park on June 18 was threatened by high winds and dark skies, but LHS members didn’t let those elements discourage them from enjoying the gathering that evening at Ft. Steilacoom Park’s Rotary Picnic Shelter. Thanks to John Huber’s vast rock collection, flapping red and blue picnic tablecloths were quickly wrestled into obedience. After-picnic speaker Kathleen Benoun, Western State Hospital Library Associate, presented a capsulated version of the park’s colorful history, from Hudson Bay Company’s Puget Sound Agricultural Company, to Historic Ft. Steilacoom, to Western State, to present-day Ft. Steilacoom Park. Just as things were winding down, big raindrops began splashing the ground as people dashed for their cars. Then the sun broke through, casting a huge rainbow over the scene—sort of like a mythical rainbow bridge from some super-epic blockbuster summer movie. Oz, maybe? Where’s the Lion, the Scarecrow and the Tin Man?